It's maybe not the most surprising news, given the Wall Street Journal's longtime web leadership, but Rupert Murdoch has officially confirmed that the WSJ will indeed appear on the iPad. But Rupert, what can you tell us about it? 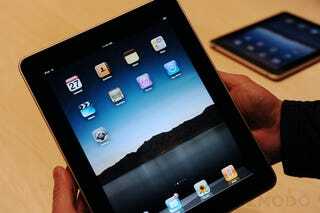 Mr. Murdoch said the Journal planned to be on Apple Inc.'s iPad tablet computer. "In fact, we've been allowed to work on one, and it's under padlock and key. The key is turned by Apple every night," he said in response to a question. "under padlock and key." The lack of detail probably comes down to iPad crisis publishers are undergoing as they scramble to find a profitable subscription model. The WSJ has never had a problem charging for what they view as premium content on the web, so presumably they'll be less likely to accept any deal they see as unfairly tipped in Apple's favor. In a separate part of the interview, Murdoch speculated that there will be "half a dozen or more" devices popping up in the next year on which we'll be reading newspapers and and accessing other media.